During my stint in the United States more than 10 years ago, I went to a Major League Baseball game and was completely taken by the beauty of the ballpark, which was a fine specimen of architecture with a classical red brick exterior. Inside the stadium, the well-maintained field was quite pleasing to the eye. I have not been to a baseball game in Japan for years, but I understand that ballparks have evolved. There are now sections for groups to party with food and drink, and infield seating areas without protective netting to afford a clear view of the action on the field. In such areas, fans obviously need to remain alert for the foul balls hit into the stands. 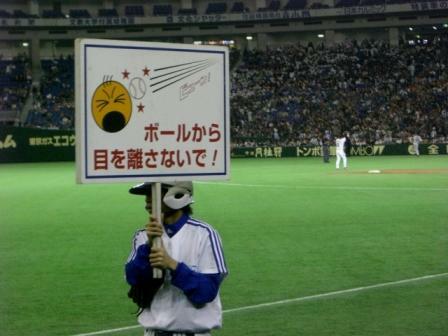 The Sapporo District Court last month ordered the Hokkaido Nippon-Ham Fighters and others to pay about 42 million yen ($348,570) in damages to a woman who was hit by a foul ball and lost her sight in the right eye. The court held the stadium accountable for insufficient safety precautions. The argument can be made that such accidents are preventable if every fan pays attention to foul balls. A counterargument to this is that since the degree of interest in games varies from fan to fan, it is the responsibility of ballpark owners to ensure complete safety from errant balls. The defendants in the Sapporo case have appealed, and the parties will continue their dispute over the pros and cons of areas without safety netting, as well as who should shoulder the ultimate responsibility for the accident, and how far. A separate case that went all the way to the Supreme Court concerned the extent of a parents' responsibility over what their child has done. A soccer ball kicked by the defendants' child, an elementary school pupil, sailed out of the school playground. A man on a bike swerved to avoid the ball, fell and hurt himself. He later died. On April 9, the court ruled that school soccer practice, in general, cannot be deemed an activity that endangers people. And since the accident was unforeseeable, the court continued, the defendants could not be held responsible for the man's death. The extent of responsibility of parties in a supervisory position is being contested in a good number of similar cases. The latest Supreme Court decision is of great significance, as it provided one pointer to resolving this tricky issue.